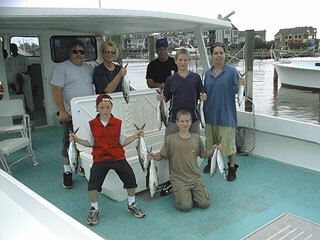 Here we have Rico Aventino (far left) and his crew of September 30 with some of limit catches of rockfish and a good bunch of bluefish, spot, and a few seatrout. Next to Rico, that's Ian, Ray, Hoyal, Gaddy, and Mark. 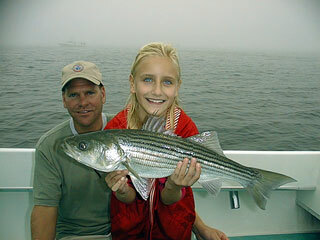 Here's Emma Bahneman and her dad Todd with a beautiful 24 inch rockfish, caught September 24 while chumming on the Gooses. 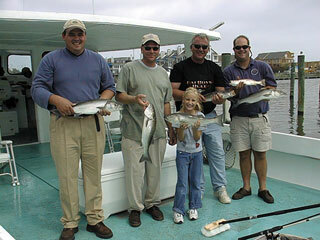 Here's the rest of the Bahneman crew with some of their limits of rockfish and a dozen or so seatrout to 20 inches. From left to right, that's John, Todd, Dave, Mike, and of course Emma in the front. Good catch guys! On September 23rd we had the Mike Fox crew out for a day of chumming for rockfish, followed by jigging for trout. 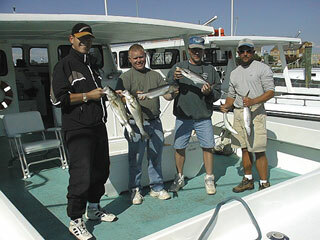 From left to right, that's Steve, Mike, Tim, Dave, and the "Foxman". 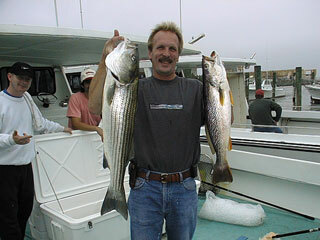 Mike had the hot hand this day, with a 32 inch rockfish and a 24 inch seatrout. Both fish were caught jigging. And here's part of the crew from the evening of September 22 with some of their rockfish and a huge croaker, caught while bottom fishing. 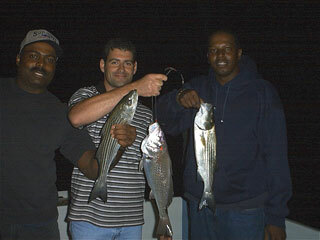 From left to right, that's Tony Rice, Marcos Milonas, and Mike Claiborne. 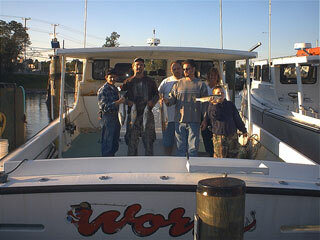 Here we have the Rich Taylor crew with some of their rockfish and spanish mackerel caught September 17. From left to right, that's Jerry, Dale, Brian, Jay, and Rich. 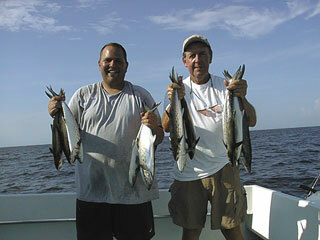 The cooler weather will probably start the spanish mackerel movement down the Bay and back to the ocean until they return to our area next August. 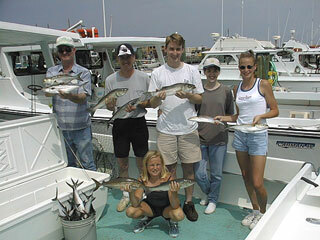 And here's the Greer crew of September 16, with part of their catch of rockfish, blues, and spanish mackerel. 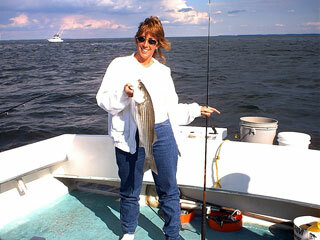 Here's Tracy with a fine rockfish caught while chumming on the Gooses. 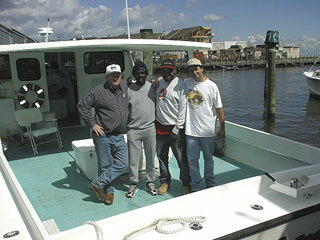 On September 16 the Worm was one of a multi-boat trip for crew-members from Bausum and Duckett Electric of Edgewater. 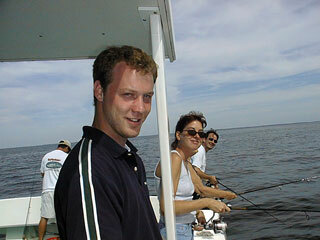 Rockfish and spanish mackerel were the catch of the day. Led by Web Hayden (left), that's Rose, Wardell, and Phil. 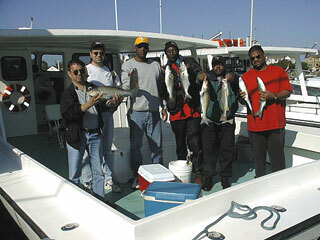 And here's the Bob Crist crew of September 15 with part of their catch of rockfish and spanish mackerel. From left to right, that's Allen, Kevin, Bob, and Jamie. 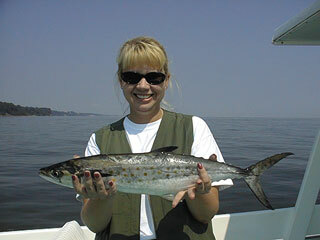 Here's Laura of the Mike Fox crew from September 10 with a real fine spanish mackerel, caught while trolling small gold Clark's spoons. 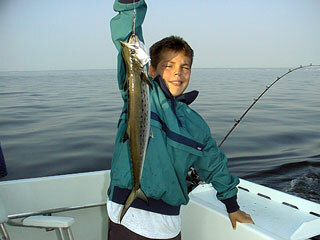 And Ryan with a 25 inch spanish that took a chrome Drone spoon. And here we have Mike Downey leading one of the crews from Strickland Fire Protection. 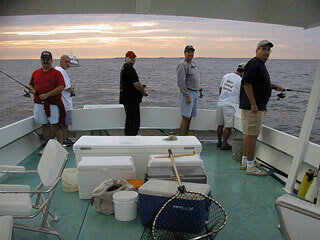 Actually, six boats and about forty people were out for a morning on the Bay. 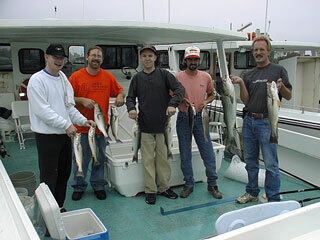 From left to right, that's Dale, Mike, Rick, Steve, Captain Drew, and Mike Downey. 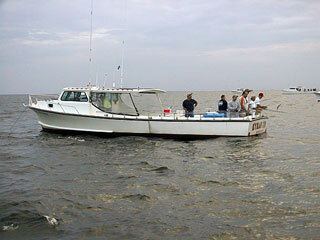 And here's the Kyran Lynn with more anglers from Strickland Fire Protection, anchored up on the Gooses. Here we have the Dave McAndrew crew from September 8, lined up along the rail waiting for Mr. Rockfish to find their baits in the chum slick. 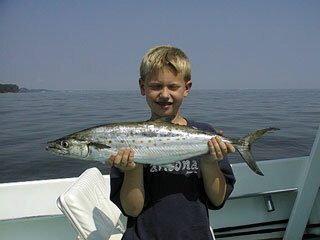 After catching our rockfish, we went trolling for blues and spanish mackerel. 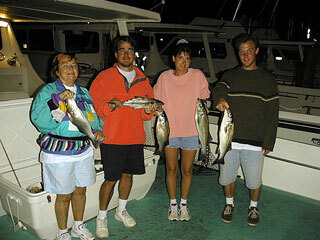 From left to right, that's Pat, Dave, Lisa, and Dan with some of their fish. On September 3 we had the Crawford Payne crew out for a family trip in pursuit of spanish mackerel, blues, and rockfish. In front that's Jonathan on the left and Justin kneeling. Behind the cooler, that's Richard, Cindi, Crawford, Joshua, and Steve. 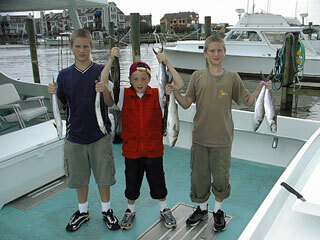 And here's a closeup of Joshua, Jonathan and Justin with some of their spanish mackerel. And here's the crew from September 2, led by Jimmy Rapczynski, with some of their catch of spanish mackerel, blues, and rockfish. That's Jamie in front, and in the second row from left to right, that's Buddy, Jimmy, Danny, Mary, and Mandy. Confirmed by Marty Gary, fisheries biologist for Maryland DNR, Mandy's catch of the day was a young greater amberjack, which took a soft crab bait. 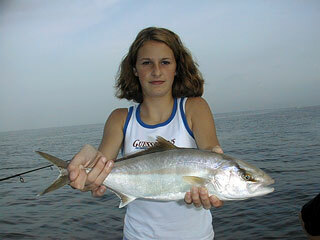 These fish are quite uncommon in the mid-Bay area. 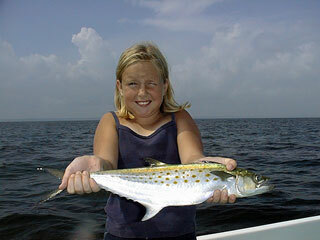 And here's Jamie with one of the citation- sized spanish mackerel which took a small gold Clark's spoon.